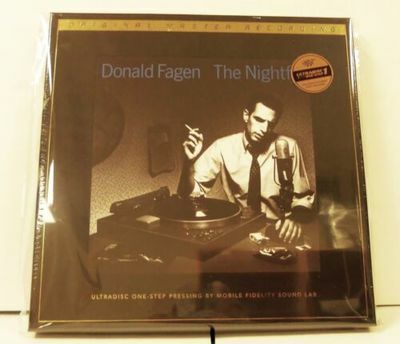 This is the factory sealed, excellent condition, MFSL master limited edition recording of Donald Fagen's "The Nightfly", #1147 of 6000. Features a second protective over-wrap. Please note: For "best offer" listings, please do not make offers "including shipping". Check the shipping for your zipcode/country and make the offer you feel works for you with shipping to be added. For auction style listings, insurance will be calculated based on the final selling price, so please wait to be invoiced before paying. We combine shipping wherever possible. We will not combine items if we feel they cannot be packed safely together, or if combining will result in higher shipping costs. If you expect you may need combined shipping, please message us as soon as you win or purchase the first item (to let us know you may need combined shipping), then message again after all related purchases have been made. We pack and ship quickly, and appreciate knowing in advance to avoid re-packing. Please wait for the combined invoice before paying. Thank you. International bidders - AS OF MAY 16, 2012, ITEMS CONTAINING A LITHIUM BATTERY CANNOT BE SHIPPED INTERNATIONALLY OR TO AN APO/FPO ADDRESS VIA THE US POSTAL SERVICE. MESSAGE US FOR ALTERNATE SHIPPING METHODS BEFORE BIDDING OR BUYING ANY ELECTRIC OR ELECTRONIC DEVICE. Items offered for international sale must be shipped insured. This requires a trackable form of shipment, and may affect shipping costs. USPS First Class cannot be tracked or insured. For this reason, we will not ship via USPS 1st Class International. Customs fees are normally charged by the shipping company or collected when you pick the item up. These fees are not additional shipping charges. We will not under-value merchandise or mark the item as a gift on customs forms. Doing that is against U.S. and international laws. Items returned to us due to non-payment of import duties, taxes, or other customs charges are not eligible for a refund. We accept all major credit cards via telephone to 330-953-2142 during our business hours (Mon-Fri 8:30-6:00; Sat 10:00-2:00 Eastern time). Payment must be received within 3 days of the close of the auction. Items not paid for in full within the 3 day period could result in an unpaid item case on eBay. If you know that you will not be able to pay within the 3 day period, please contact us before bidding. If unforeseen circumstances arise after purchase, message us as soon as possible. If you have any questions about your auction winnings, please feel free to call us during our business hours at the number above. Shipping for this auction is determined by eBay's shipping calculator at the bottom of the page. Your order is professionally packed and shipped FAST via our FedEx/USPS/DHL ASO certified shipping department via FedEx, USPS, DHL. Combined Shipping: We combine shipping. Please notify us before payment of any item if you plan to bid on any of our other auctions. We can send you an invoice with the combined total for all items and shipping. Failure to contact us will forfeit your option for combined shipping, and you must pay shipping on each individual item. PO Box users: A physical address (not a PO Box #) is required for non-USPS shipping. If you have questions, please contact us regarding shipping. Alaska, Puerto Rico, and Hawaii Residents, please ask for a shipping quote before bidding on any item. ShipOnSite takes great care in packing and shipping our items to ensure safe delivery to you. We pack using industry standards and insure domestic shipments (FedEx, UPS, USPS) for the actual selling price. We charge a handling fee to cover our costs of materials and labor. Handling is nonrefundable. Local Pickups: We welcome local pickup on any item. All local pickups are charged the local OH sales tax. Some of our larger Items that are defined as "Local Pickup", are held with our consignors off site, generally at their homes. Once payment is received, we will put you in contact with our consignor to arrange the pickup, if necessary. It is possible for there to be unforeseen moving related expenses, and the buyer will be responsible for those fees. Every attempt will be made in advance to determine the possibility and extent of those charges. If these charges are known, they will be added to the listing. Please see About ShipOnSite for store hours and directions. ShipOnSite of Boardman is a full service packing and shipping center with eBay consignment services located in Boardman, OH. We are an authorized shipping outlet for FedEx, USPS and DHL. You can guarantee that your auction winnings are professionally packed to industry standards at rates competitive with other national packing and shipping centers. ShipOnSite is not the owner or seller of these goods, but merely a consignee acting on behalf of the seller to facilitate the sale of the goods by holding the goods until such time as the sale is complete and the goods are shipped to the buyer. SHIPONSITE SPECIFICALLY DISCLAIMS ANY IMPLIED WARRANTIES OF TITLE, MERCHANTABILITY, FITNESS FOR A PARTICULAR PURPOSE AND NON-INFRINGEMENT.